Have you ever seen the Mel Gibson/Julia Roberts movie, “Conspiracy Theory”, about a paranoid man who believes there are conspiracies everywhere and that someone is out to get him? He concocts so many conspiracies, that he is eventually bound to run into a real one….and he does. As the mother of three growing farm boys, I often sympathize with Mel’s character. I see plots everywhere in their innocent utterings of “Nothing”, “Not me”, “No, I don’t know where that is”. I admit that their conspiracies are generally limited to things like storing all of their dirty (and clean) clothes under their bed because it is easier than carrying the hamper to the laundry room or folding and putting them away. I try to stay on top of these so that when they are teenagers, they know they will never be able to pull the wool over Mom’s eyes (**delusion alert**). A couple days ago, I found out about a real, full-fledged, “don’t tell Mom”, farm-boy conspiracy theory. Before I launch into the conspiracy, it will help if I provide some background. We have accumulated a motley flock of colorful chickens. All of them are here due to the pleading of my sons and not because I wanted them. To their credit, the boys take excellent care of and really seem to like their chickens. Of course, some of the chicks we acquired were destined to be roosters. 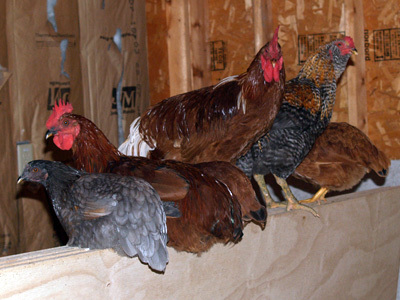 At one point, we had four mature roosters. During certain parts of the year they were unbearable. They fought, fought, and fought some more. These lovestruck roosters were also great at tearing feathers off the backs of the hens, which makes them unsuitable for showing at the county fair. The chickens making themselves at home in my garage. Those roosters, their fighting, and the resulting tears from upset children (when their favorite rooster or hen was injured) were an aggravating part of my existence. I spent countless hours (and too much money) building or improvising pens to keep those roosters away from the hens and each other. The boys really wanted to hatch out some of their own eggs and I refused, because it would inevitably lead to more roosters. Instead, I took them to the local farm store and we picked out six nice pullets (female chicks). They seemed happy for a while, but we’re soon again asking if they could hatch their own chicks. Because winter was coming, I managed to hold off their requests….until January. Unbeknownst to me, a couple of the hens started to “set”. For those who don’t live on farms, that means that they get very protective and spend most of their time setting on the eggs, which incubates them. The boys noticed this behavior and left the eggs with those hens, hoping for chicks. All the while, their confused mother was wondering why the number of eggs making it to the house suddenly dropped off. I was alerted to their scheme by my farmer hubby, who was worried that I might accidentally bring those eggs in the house one day and mix them with the good eggs. In about 10 days or so, we will know if the Great Chick Conspiracy worked. As a precaution, I probably should get started building some rooster pens now. good luck with the Chic Conspiracy but it sounds like you may be in the chic business! Yes, the boys are excited!